I LOVE face masks. There is nothing better than putting a cool mask on your face after a long day & relaxing while it works it’s magic (with a glass of wine in hand, of course). But I refuse to spend good money on facial masks when drugstore products work great. Britta and I have been using the Queen Helene Mint Julep Masque forever. I think our mom first let us try it when we were in elementary school. You know, the pre-zit era. The good ol’ days. It is probably still my favorite mask on the market & at $4.29 per bottle, you can’t go wrong. I’m also a big fan of Freeman masks. 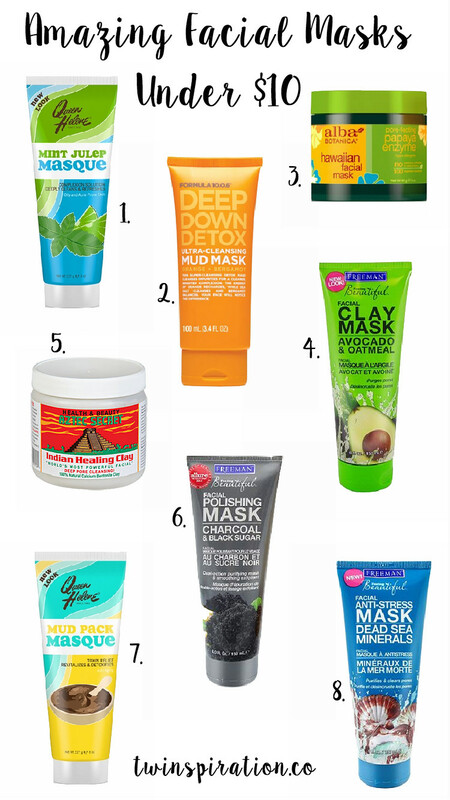 My favorite is probably the charcoal & black sugar mask. It makes my skin SO smooth and it smells amazing. It’s not too abrasive either which is sometimes the problem with sugar-based masks. I’ve bought my Freeman masks from multiple stores and the cheapest I have found it is at Ulta. All of the Freeman links above link directly to Ulta’s website, so make sure to find a store in your area! Why spend over $4.29 when you don’t have to?! Let me know what your favorite mask is in the comments down below! I’m going to try one of these! The Aztec Secret Indian Healing Clay Deep Pore Cleansing Mask is my all-time favorite mask! I’ve just LOVED every Freeman mask I’ve tried. It’s crazy how great they work for such a cheap price tag! You’re welcome, thanks for stopping by! The queen Helene mint julep does wonders for even my hormonal acne and redness in general. I recently started using queen Helen mud pack mask and love it just as much. we’re going to have to try the mud pack mask, thanks for the tip! Great blog. I love the Aztec clay healing mask. Now, it is out of stock at my local Sprouts. I know this comment may be a bit late lol but I am really into sheet masks! Those are amazing and at a pretty good price as well! I really want to try this out! Do you find this on any drugstore? I am in Canada. Thank you! !